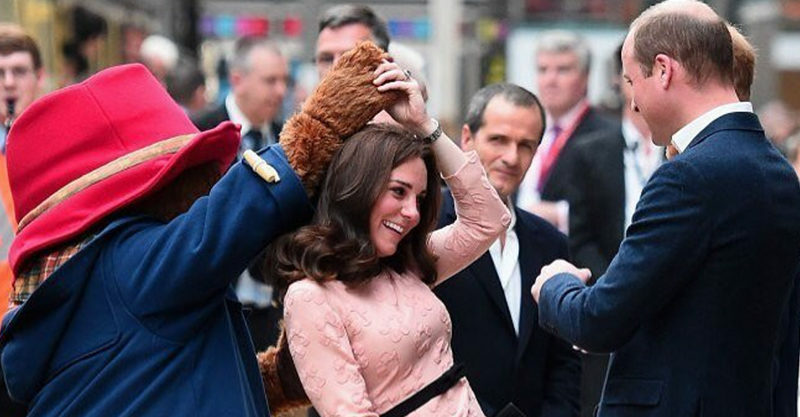 Kate’s not letting the recent bump shaming and lingering illness get in the way of taking a turn around the dance floor – or train platform – with the beloved-by-many Paddington Bear. To be honest, this is the bear-shaped boost we didn’t know we needed today! Kate – who is pregnant with baby number three – is on the slow mend after being bedridden and housebound with Hyperemesis Gravidarum – a condition that causes chronic vomiting and general feelings of dreadfulness. Kate stepped out for the first time since September, early last week, at a reception for the young royal’s mental health awareness initiative, Heads Together, debuting her baby bump for the very first time. Of course, sadly, nobody goes unjudged in this day and age. Snarky types were quick to decide that Kate didn’t look the way they thought she should, and were keen to let her know via the Kensington Palace Instagram account. One would hope that she adheres to the old adage ‘don’t read the comments’ and was shielded from this nastiness. Overnight, much nicer discussion was sparked, as cute footage of Kate dancing with a person-sized Paddington Bear emerged. Prince William, Prince Harry and Kate were meeting everyone’s favourite bear at a charity event for children at London’s famous Paddington Station. It seems the dapper, hatted bear was determined to make the occasion a particularly memorable and twirly one! “She’s a right good mover, and I think she could win Strictly Come Dancing – if she was in it,” Paddington Bear revealed, after the dance. This was apparently a surprise appearance by William and Kate, who had been expected to stay away due to the Duchess’ ill health. The chance to shake hands with a famed storybook character seemed too exciting an opportunity to resist, however. Not only did William and Kate show up and delight the assembled crowd, they wholeheartedly threw themselves into the proceedings. The assembled children were packed onto a train for a quick trip into the English countryside, to celebrate the release of the film, Paddington 2. William, Kate and Harry also boarded the train for a quick chat with the little passengers, before they waved the children off on their journey. It’s all a bit super-freaking cute and we’re guessing this was one non-stuffy royal event the couple’s young children, 4-year-old Prince George and 2-year-old Princess Charlotte, wished they’d tagged along to!